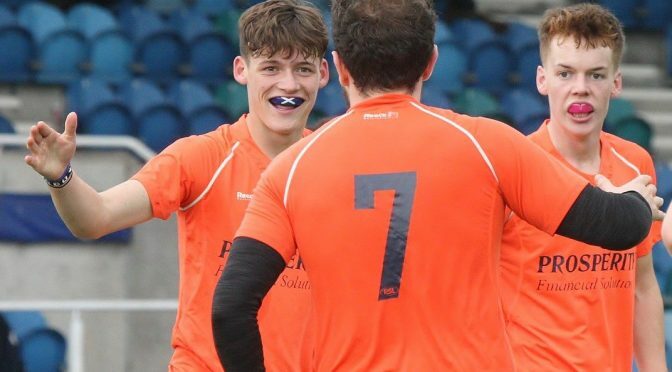 Clydesdale Men’s 1st XI completed the first half of the season by taking a point away from Auchenhowie in their Men’s National Division One clash against league chasing Western Wildcats. The M1s got off to a flyer in the opening exchanges of the game when forward Struan Walker pounced on a defensive error to round Wildcats goalkeeper, Gavin Sommerville and convert to give the away side the lead. From then on, Clydesdale stepped up in a bid to grab a second but missed out despite chances from Walker and Aidan Black. The home side made the M1s rue those missed chances and level the scoreline when a pass from Rhury Smith was deflected in from Fraser Calder past ‘Dale goalkeeper, Sean Mahoney. The second half was a more open contest, with chances aplenty for both sides. Wildcats forward Andrew McConnell was denied by Mahoney from a penalty corner, whilst Clydesdale had corner opportunities themselves, but were denied by a sturdy home defence. The M1s had a massive opportunity to take all three points when Andy McAllan was awared a penalty flick having seen his shot illegally blocked on the line. But sadly, Andrew Allan’s effort from the spot was saved well by Sommerville. Credit to Allan, however, who along with his fellow defenders kept their composure towards the final knockings of what was a frantic end in both sides attempts to win the game. Wildcats and Clydesdale could not find the winning goal as both sides settled for a point. The result takes Clydesdale level on points with Hillhead, but remain in fifth behind their west end rivals on goal difference heading in to the indoor period. In the rest of the weekend’s games – starting with Saturday – saw the M3s record their biggest win of their season so far in their Men’s West District Division 1A contest with GHK 1s at Titwood. Sam Jamieson, David Sturgess and Jeetinder Berman all finished off flowing team moves, before Sturgess grabbed his second from a drag flick in a first half overtime corner. Sturgess went on to complete his hat trick midway through the second half before Ethan Robertson completed the scoring at 6-0 for the M3s. The M4s narrowly won 2-1 in their clash at home to Hillhead 6s in Men’s West District Division Two. Goals coming from Eddie McLean and a superb deflection from youngster Jack Nairn. The M5s has a more difficult day when they lost 6-1 in their away game against Ayr 2s in Men’s West District Division Three – Iain Flynn scoring a mere consolation. In the ladies matches, the L2s finished Saturday’s card of home games off with a hard fought 3-1 win at home to Grove Menzieshill 2s in Women’s Championship Division One. Martha Lawson converted an open play move from just off the penalty spot five minutes before half time. Lucy Arnold then doubled the home side’s lead into the second half ten mins into the second half. Grove 2s pulled one back from a penalty corner but the two goal lead was restored when Lawson reversed a rebound from a corner high into the Grove goal. In the same league, an under strength L3s team took a point in their visit to Edinburgh University 3s. Anna Winter’s first goal for the L3s gave her side a 1-1 draw. The L4s, L5s and L6s all tasted home defeats in Women’s West District Division One, Two and Three respectively. The L4s lost 3-1 to Troon 1s despite a goal from Kirsty Forgie. The L5s went down 3-0 to a strong Uddingston 2s side whilst the L6s lost 2-1 to Troon’s 2nd XI – Rachel Brewer scoring for the L6s. On Sunday, the L6s luck didn’t change despite an encouraging performance at home to WWD Division Three leaders, GHK 3s. The home side lost 3-0, but the result of the day followed in the match after. The L3s fought to a deserved 1-0 win against the L2s in Women’s Championship Division One. In a competitive contest throughout, both teams had corner chances which went by in the opening half. It was more of the same in the second half, but it was the L3s who converted a corner with ten minutes to play in the second half. Helen Walker’s shot from the top was initially saved by L2s ‘keeper Mairi Fletcher, but the rebound was scrambled in by corner injector, Helen McNaught. The L2s pushed forward in vain to force an equaliser and almost got it with a few minutes left on the clock as Heather Lang found space in the circle to release a shot but was closed down quickly by L3s goalkeeper, Cara McCallister. The L3s saw out the final minutes of the contest to seal a 1-0 win – a result which has now put a serious dent in the L2s bid to be champions of Women’s Championship Division One.